We’re back with another sketch challenge for you from the Paper Craft Crew! Wow – it was so great seeing all of the amazing projects submitted for last week’s challenge – I can’t wait to see what you make this week! I decided that I needed to get more use from my Free Sale-A-Bration set, Honeycomb Happiness! I’ve used the cute little chick, but not the ice cream cone, so here it is! I just love the adorable ice cream patterned paper from the Birthday Bouquet DSP , but I didn’t want it to overwhelm the whole card, so I just used a panel of it in the background. I did use it for pulling my colours together, though – that’s one thing I really love about SU! products – the ease of coordination! I started with a card base of Mint Macaron cardstock. Then I took a panel of Blushing Bride cardstock, and created my own pattern by stamping the ice cream cone stamp from the Honeycomb Happiness set all over it in Blushing Bride ink, for a tone-on-tone look. I then added a strip of the Sale-A-Bration Metallics Glitter Tape in Silver (sad to say, this is all sold out!) across the width, about 2/3rds of the way down. Then I added my panel of Birthday Bouquet DSP with the ice cream pattern. I took a piece of Mint Macaron cardstock and repeated the tone-on-tone look with the ice cream cone stamp and Mint Macaron ink, but I felt that it was just too ‘heavy’ when I layered it on top of the DSP. So, I decided to lighten it up by placing the same size piece of Vellum Paper over top of it; just plain, no stamping. I’m still on the fence as to whether I’m happy with it or not; perhaps I should have stamped the cones again on the Vellum? On some scrap Whisper White cardstock, I stamped the cone in Crumb Cake ink, then stamped the ice cream 3 times, once each in Mint Macaron, Blushing Bride and Watermelon Wonder inks. I coloured them in using the same inks and used Blender Pens for a lighter look. I then added them onto the card, stacking them up with Stampin’ Dimensionals. The sentiment is also from the Honeycomb Happiness set, which I stamped in Blushing Bride ink onto Whisper White cardstock. I then die cut it and the Blushing Bride layer behind it using the Tags & Labels Framelits dies. 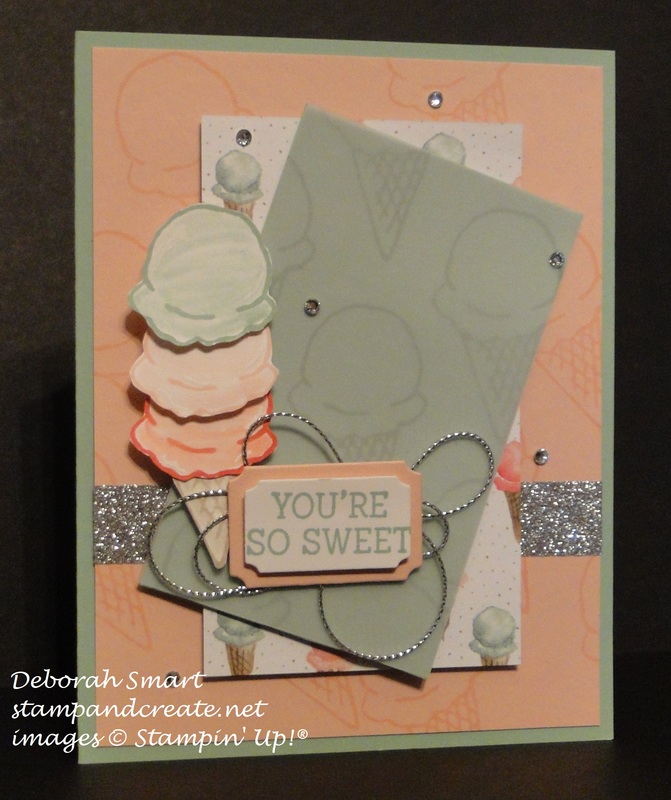 I added some loops of Silver Cording Trim behind the sentiment, then added it to the card front. For a final touch, I scattered a few Silver Sequins on the front. I’m looking forward to seeing your card added to the challenge – have fun being creative!